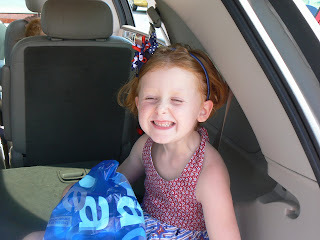 Crafty Little Beana: It was another Great Fourth! 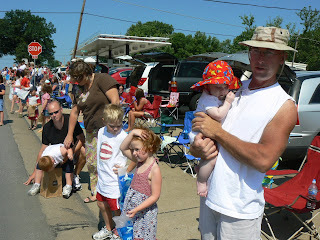 I hope everyone enjoyed the Fourth as much as we did! We started with the traditional Parade. Our town still has a small town feel, but is growing to a large town quickly. We stood in the same spot we have for the past three years. It was a beautiful day. The weather could not have been nicer. We went home, had lunch, and let Adler get his nap. Then Gina and I headed over to the party! 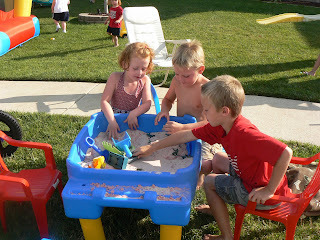 We lived with my sister while our house was being built, three years ago, and we were adopted by her court as neighbors. They have included us in everything ever since. It is great! Our neighbors aren't in the same phase of life as we are (most are retired) so Gina has a blast with all of the kids here. 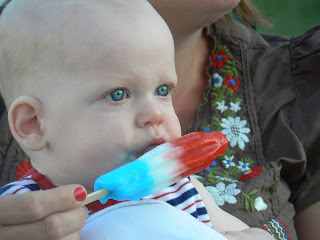 Adler enjoyed his first ever BOMB POP! 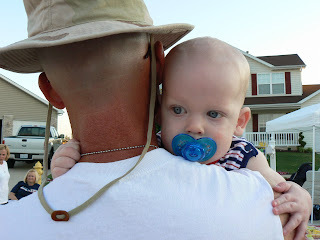 Then a tuckered out little boy and his Daddy headed home, before the fireworks! Adler loves a routine! He is pretty fond of his Daddy too! *Oh I made Gina's dress for her to wear 2 years ago, she wore it then, and it still fits! Yeah! Looks like a fabulous time was had. I was just thinking that Gina's dress looks really appropriate for the celebrations and then saw that you sewed it. Looks cute! that Popsicle looks so tasty!